I remember a few years ago and the only setting sprays on the market in the UK were the Urban Decay ones, fast forward a few years and now nearly every brand has one. Including affordable brands. Today I wanted to share with you my current favourite 5. This is an oldie but a goodie! It promises to keep makeup looking fresh for up to 16 hours. Which is a pretty bold claim. I do really like this but I don't actually think it prolongs my makeup wear time. It does keep it fresher for longer - like it's been freshly applied. I do find this helps prevent my makeup from creasing and sinking into fine lines to. The mist on this is very fine and it dries pretty quickly to. I like how this doesn't alter the finish of makeup to. Overall, this is a great one. For keeping my makeup on longer this is the mist I reach for. Although I will say this smells a little like old ladies but this disappears once it has dried. This has so many good skincare ingredients to, such as Green Tea and Niacinamide! It's super hydrating. I also find this helps my makeup mesh a bit with my skin and takes away that powdery look that some powders leave behind. I love this as a mid morning pick me up to, it's just feels so nice and refreshing on the skin. This dewy setting spray from Cover FX literally ticks all the boxes! This is described as dewy but I don't think this alters the finish of my makeup that much, it does give it more of a luminous finish but I wouldn't say dewy. Anyway that aside this is brilliant. It really does keep my makeup longer and keeps it looking fresh while, melting everything into the skin a bit better. The mist on this is so fine, you can't really even feel this touching the skin! It stops my makeup sinking into fine lines and creasing. It's also worth noting that this is alcohol free. This is the newest addition to my collection and one that's become a staple! It's an illumination one that has a super fine shimmer to it that gives the skin a veil of radiance. It doesn't look over the top or glittery though. In terms of setting makeup this really does, you can almost feel it drying everything into place. But not in a way that you've sprayed hairspray on your face or anything. This does also need a good shake before applying. The mist isn't the finest I've ever come across but for just £4 this is definitely one to check out. There's also a matte version that I'm currently testing, I'll keep you updated on it. Last but not least I have my longstanding favourite from Milani. For makeup staying power this is brilliant. It really helps to lock my makeup in place and keeps it looking fresh all day! it also makes all my makeup look a little more flawless and blended. This is like MAC Fix+ in terms of finish but has the benefits of keeping my makeup in place. The mist is super fine and it doesn't drown my face. 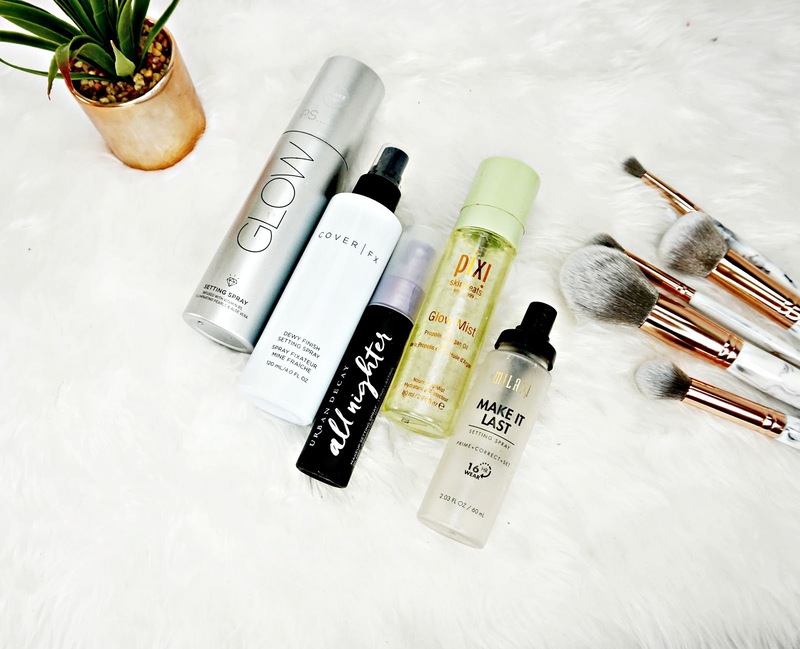 It's a brilliant setting spray that I can't recommend enough.